The selective and sensitive detection of chemical pollutants is an environmental challenge as, nowadays, many industrial products contain nanoparticles (paintings, cosmetics, food). The sensor, developed in collaboration with a group of ITODYS, is an inverse opal (air spheres in a dielectric matrix) made in a polymer imprinted with a specific target nanoparticle. The reuptake of the target nanoparticle induces a swelling of the polymer leading to an increase of the air spheres and so to a modification of the optical response of the photonic crystal. The detection is performed by measuring the spectrum of light reflected by the sensor at a given angle : a red spectral shift is observed as the amount of target nanoparticles increases (see spectra of Fig. 1). The synthesis of the sensor is based on cost-efficient soft chemistry techniques. The starting point is a silica opal filled with a solution containing a functional monomer, a cross-linker and the target nanoparticles (here colloidal nanocrystals). The mixture is then photopolymerized under UV light and finally silica and nanocrystals are extracted with fluoridric acid (see Fig. 1). Figure 1 : Schematic of the sensor and evidence of the spectral shift in the presence of the target. The sensor has been characterized in terms of sensitivity and selectivity. Without trying to reach the detection limit, we have detected concentrations of nanocrystals as low as 8x10-11 mol/L ( 0.025 ng.mL-1), corresponding to a 40 nm-spectral shift with respect to a reference (given by the deposition of the same volume of a buffer solution free from nanocrystals). This value is, for example, clearly lower than the detection limit obtained for the detection of CdS nanocrystals by electrochemical method. 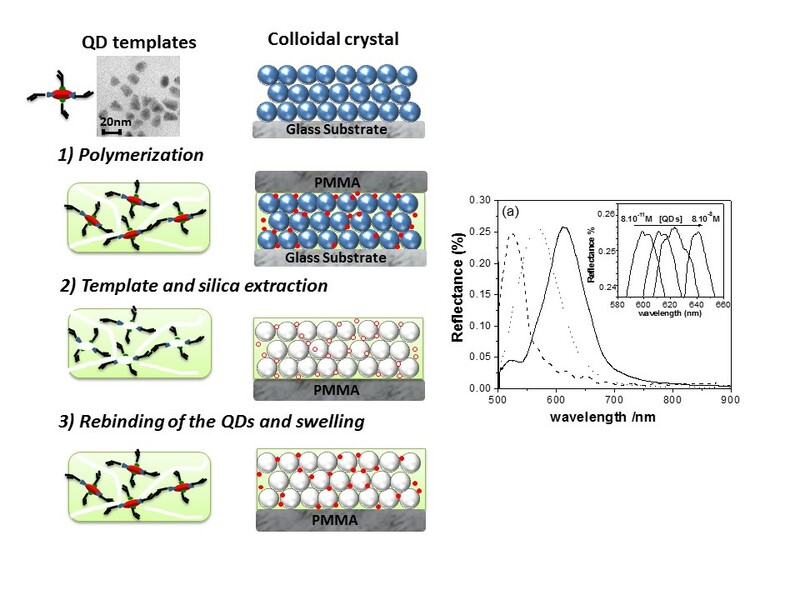 We evidenced the selectivity properties of the sensor by infiltrating the inverse opal with nanoparticles of different nature, size or surface chemistry. For these different kinds of nanoparticles, spectral shifts four times lower than for the target nanocrystals have been measured. 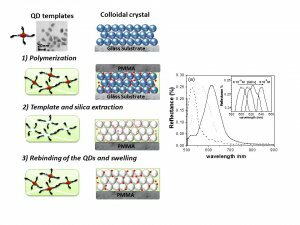 The association of opals and stimulable polymers is thus an efficient way to develop cost-efficient, easy to use, sensitive and selective sensors of nanoparticles.